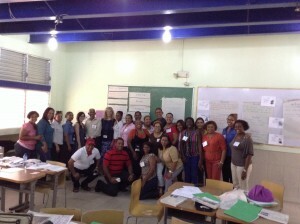 Today I received an email from our TMA (Teacher Mentors Abroad) Coordinator in which she shared the reflections from the educators who attended our 4 day Conference in the Dominican Republic in July. As a team, we were thrilled with the positive comments about our ability to inspire our participants, not only during the conference, but as they return to their respective roles this fall. Our audience was comprised of new teachers, experienced teachers, principals and superintendents and therefore our messages about implementation were differentiated in order to meet their needs. It was rewarding to see that we were able to share strategies which our participants could easily translate into their practice. Words like dynamic, fun, motivating and charismatic have a wonderful way of jumping off the page and reaffirming that our decision to take the learning to the next level was appreciated and acknowledged. The foundational text for our work in the Dominican is the Tribes book. We use that mentor text as we demonstrate how to create a community within a classroom and use various strategies to support a cooperative learning environment. Daily, we modeled many of the energizers and then took the discussion to a deeper level in terms of connecting the strategy to both community building and curriculum connections. As our participants became comfortable with the Tribes book, they took on the challenge of leading the energizers. On our final day, the energizer of choice was the Spider Web. As the ball of yarn was tossed from person to person we reviewed what we had learned yesterday and our expected individual learning goals for the day. As the activity wrapped up (no pun intended), I was presented with the ball of yarn as a reminder of the group and their appreciation. Such a simple, yet complex and thoughtful gift. The importance of knowing your student as a person and as a learner was discussed through the exploration of Multiple Intelligences. As a consolidation task, we had groups demonstrate how they would teach someone to tie their shoe laces, based on one of the Intelligences. Our Dominican educators love to sing and act, so we had some amazing presentations. The visual group drew a picture of a “conejo” ~ rabbit ~ and proceeded to give instructions about rabbit ears. I immediately shared that I had used the “bunny ears” technique to teach my own children how to tie their shoes. 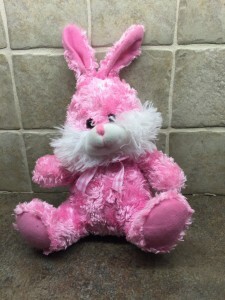 The next day, one of our participants ~ Wendy ~ called me over and proceeded to give me a small pink bunny. Such a simple, yet complex and thoughtful gift. 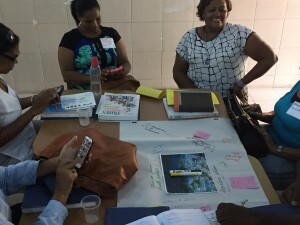 For the conference this year, we focused on the Dominican science curriculum, specifically the environment, and shared ways to purposefully connect literacy expectations. Their cumulative task was to present a Public Service Announcement based on the themes we had developed in conjunction with the environmental issues plaguing the Dominican. We were completely amazed at how much work the participants did (beyond the hours at the conference) to prepare for their final presentation. As we came to the final day and the closing ceremony, I couldn’t help but become overcome with emotion as the Director and the Superintendent shared their appreciation for our dedication to TMA and for our work with their educators. 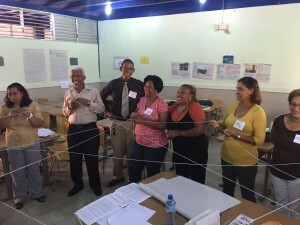 It is becoming evident that the work of TMA is making its way into classrooms in the Dominican. As with all changes in education, it takes time, persistence, dedication, and an unwavering commitment. I will cherish my “conejo” and ball of yarn as “simple, complex and thoughtful” memories of our 2016 TMA conference. Have you received a “simple, complex and thoughtful” gift? What was it for? Take 9 women, all with luggage for a week, 150 Tribes textbooks in Spanish and supplies for a week-long conference and one can expect that transportation may pose a challenge or two. Our air travel was uneventful, but worthy of a shout out to WestJet for their courteous service and humanitarian baggage policy which allowed us to check all of our bags without any cost. As this year’s TMA team arrived in the Samana airport, we were lovingly greeted by Gloriannie (our Dominican contact ~ extraordinaire) and her father Pastor Lopez ~ our host for the next week. As our driver expertly loaded our mounts of luggage into the back of a covered wooden trailer, we piled into a van (thankful for air conditioning) and started on our 2 hour trek to Hainamosa. The drive is beautifully scenic with lush fields of produce, towering mountains and winding roadways (some smooth and some “not so smooth). It was about an hour into our drive when one of the “not so smooth” roads may have been the impetus for the tire on the trailer to burst. But, just as our driver had expertly loaded our luggage, he expertly changed the tire with the spare and we were on our way again. Travelling a little more cautiously, as one does on a spare, but still moving closer to our destination, which would include one of Gloria’s famous “Welcome” meals ~ complete with fresh mango and pineapple, we continued along the roadway. 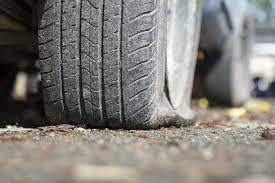 And yet our trip was not to be without some more excitement, as the spare tire burst and now we hobbled along the side of the road with the few remaining bits of rubber clinging to a soon to be completely dented beyond recognition wheel rim. Pastor Lopez once again phoned his wife to share that our arrival time had been delayed. As we chugged along, we passed a young boy who was walking on the side of the road. The Pastor asked him if there was a place close by that repaired tires. The boy provided directions and we continued along on our way. Within minutes, on our left we saw a brand new Texaco station and assumed that with a click of our left blinker, we’d be repaired and back on the road in no time. But to the surprise of the passengers, we took a right turn down a dirt road and then a left into a small rural village. Homes were mainly constructed of corrugated metal, the tire repair shop was a small lean-to with several young men sitting out front enjoying their Saturday afternoon. Young girls prepared hot tea and served the men, a young boy led a cow deep into the village, younger boys were playing a game of lassoing each other and then 15 minutes later that same lasso was used by one of the boys as he rode a small horse down the road. At one point a large truck with an open flatbed drove by, overflowing with men (possibly on their way home from the fields). A family of 5 drove by on a scooter (I still shudder at the lack of safety features, such as helmets or shoes). Dogs and chickens roamed aimlessly throughout, as young children played tag. 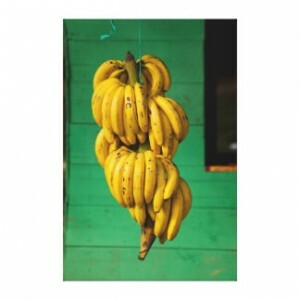 A young man drove up on his motorcycle and purchased an entire “rack” of bananas and the children operating the fruit stand rummaged through their belongings to find a rope long enough to secure the bananas to the back of the bike. Our tire repair became quite the scene with lots of spectators and many offers of advice. Pastor Lopez continued to connect with Gloria letting her know our status and new estimated time of arrival. Women entered the village with parcels of food for their families and the young girls giggled as they sauntered past the young boys who initially didn’t pay any attention ~ only to take a glance backwards once the girls had passed. As all of this life was going on, there was a young boy about 4 sitting at the fruit stand, on bar stool, leaning back on his elbows and watching absolutely everything. He didn’t move, he didn’t engage in conversation with anyone ~ he just sat there, taking it all in. Although time seems to stand still for us when we’re guests in the Dominican, I would venture to guess that our pit stop probably took 30 – 45 minutes. And all that time, that young boy was content to sit and watch life around him. As we cheered for the repaired tire and our return to the main highway, the vision of that young boy stayed with me. We hear countless stories about how our children can’t sit still in class and one can’t scroll Facebook or Twitter without coming across at least one article on a daily basis about our children and their decreasing attention span. The rate at which we are diagnosing ADHD and ADD is alarming. I can’t help but wonder if we’re giving our children the right things to watch and engage with. The young boy, at the side of the road in the Dominican, certainly didn’t need reminders about paying attention ~ his view from the side of the road was enough!